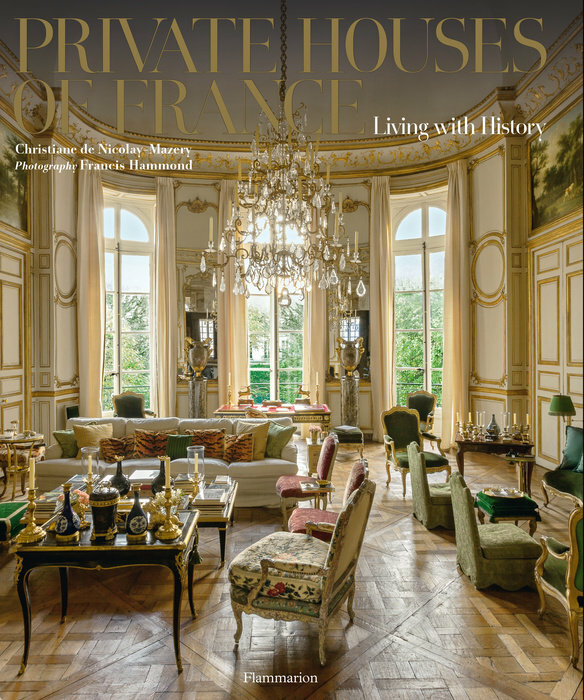 Private Houses of France: Living with History is an historical, cultural, and architectural journey through a dozen exquisite and refined French châteaux and residences. A dozen aristocratic French families invite readers to experience their elegant lifestyle, from the royal stag hunting tradition of Louis XI and Louis XIII at the Château de Champchevrier to Hubert de Givenchy’s elegant Parisian townhouse imbued with grandeur and comfort in the style of Napoleon III. The featured houses, illustrated with specially commissioned photography, represent key periods of French decoration. The exquisite Renaissance architecture of Château d’Anet and its sumptuous interiors with great fireplaces, silk upholstered sofas, and soft lighting exude the notorious ardor between Henry II and Diane de Poitiers. The hidden sanctuary of a Parisian manor reveals a dignified library and a harmonious blend of antique and contemporary fabrics and sculptures. A grand salon with Versailles parquet is illuminated by a Louis XVI crystal and amethyst chandelier. Meticulously planned gardens beckon contemplation and dining tables replete with crystal and silver are a visual feast. From the architecture, garden designs, furniture, textiles, and art collections, these exclusive private homes are a rich source of interior design inspiration. Christiane de Nicolay-Mazery spent twenty-five years at the leading Parisian auction house, Hôtel Drouot, before joining Christie’s France, where she is a board member. She has published many books, including Private Houses of Paris and French Interiors: The Art of Elegance. Francis Hammond is a renowned lifestyle photographer. His work has appeared in many international magazines, including Elle and Martha Stewart Living, and in books such as Historic Houses of Paris: Residences of the Ambassadors and Versailles: A Private Invitation.